Book Review: Learn to Crochet NOW! Title: Learn to Crochet NOW! 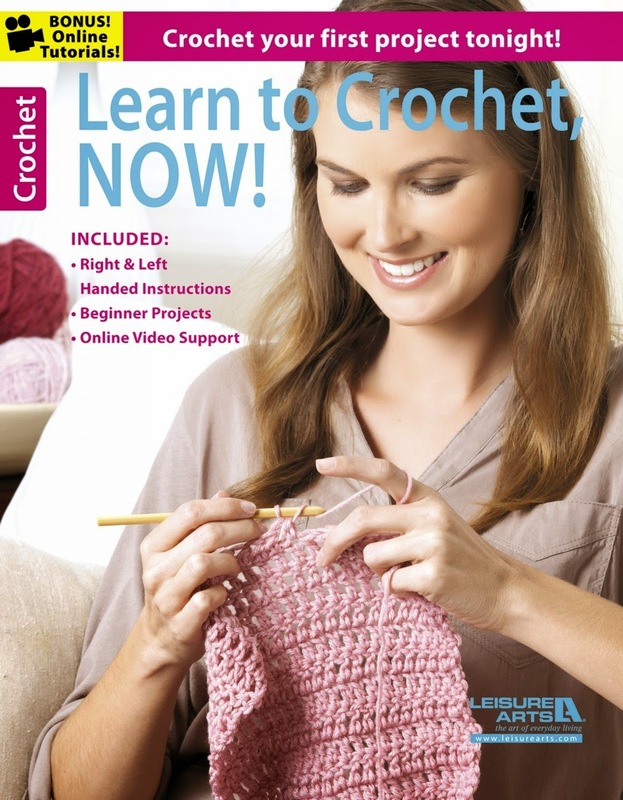 This new basic instructional book on beginning crochet by the creative minds at Leisure Arts has a lot going for it. For starters, it includes mostly photographic pictures for BOTH right- and left-handed crocheters; as a leftie who initially had a hard time learning to crochet, this is huge! Also, Leisure Arts has included links for further online instructions to reinforce learning. That’s right…you can watch EACH TECHNIQUE ONLINE! The project count is four, with a spa cloth that teaches how to chain and work single, half double, double and treble crochet all in the same project. There is a lacy lap robe that takes things to a little higher level of difficulty, as well as two scarves. All of the projects are worked in worsted weight yarn and size H and larger sized hooks, which help to make learning the foundation of the craft much easier than learning with smaller hooks and yarn. Leisure Arts has added a good basic title to the crochet world for those looking to either break into learning how to crochet or for those who already crochet, but want a resource to share with those they know who would like to learn how. This book, a skein of yarn and a size H hook are all one needs to learn how to crochet. The next time I teach someone to crochet, this is definitely a good basic resource that I will refer my pupils to. Full disclosure: A free review copy of Learn to Crochet NOW! was provided by Leisure Arts. Although I accept free products for review, I do not accept additional compensation, nor do I guarantee a positive review. My reviews are based entirely on my honest opinions. Sainio, also the author of 100 Snowflakes to Crochet, brings us a second volume of beautiful thread crochet. Along with the self-described lace flowers, there are also directions for several lace leaves, a dragonfly, a caterpillar and a couple of butterflies. This volume includes both written and charted patterns for each individual motif. But Sainio doesn’t stop there. She also gives several ideas for different applications for the flowers, leaves and insects, including using them as stand-alone projects, such as napkin rings, corsages and a cute garland, as well as using them as embellishment on ready-made items, such as clothing and home décor items, such as pillows. Really, one is only limited by their own imagination. I am picturing jewelry, hair accessories, glass cozies, wine glass markers…the list is endless! One could even explore making the motifs in heavier yarn and larger hooks for afghans or freeform applications. While this book may not be appropriate for a brand new crocheter, there is a nice crochet refresher course at the front of the book, which includes instructions on how to read symbol crochet. The reader is also treated to several eye-pleasing “Floral Collection” photos at the front of the book that will entice you to grab a hook and some thread. Several varieties of flowers are represented here and there are no doubt a large enough variety of blooms to satisfy any flower-loving crocheter. 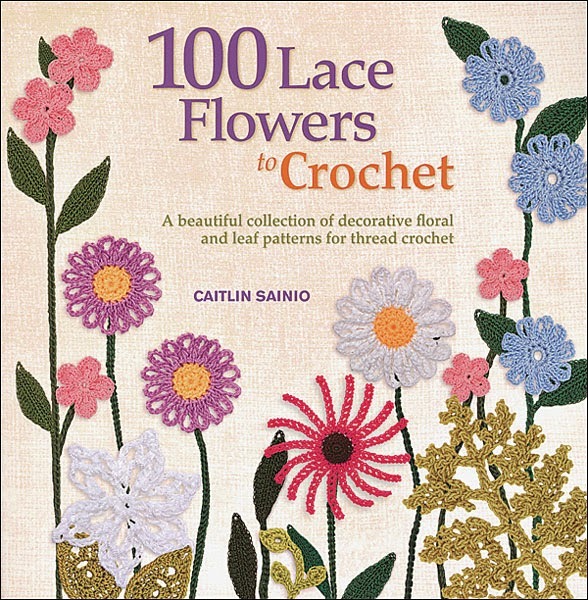 Get your copy and crochet your own flower garden! Full disclosure: A free review copy of 100 Lace Flowers to Crochet was provided by St. Martin's Griffin. Although I accept free products for review, I do not accept additional compensation, nor do I guarantee a positive review. My reviews are based entirely on my honest opinions. What is it about babies that cause people to pick up their crochet hooks? I suppose it’s some combination of memories of those special handmade items gifted to us as babies, the way a wonderful gift can come together in a relatively short time with not too much yarn, and the fact that babies look just so cute in handmade items. In the introduction of Sweet & Simple Baby Crochet, Kristi Simpson notes that as the mother of five children, she understands “that buying cute clothes and hats that your baby will outgrow in a just few months is an indulgence not everyone can afford.” (That’s the other reason we turn to those hooks for babies: many of us can crochet something for less money than we can spend on a store bought gift - not including labor, of course.) The book then launches into the patterns. There are actually 46 designs included because several patterns are sets - like matching hats and diaper covers - with two pieces. Each design includes a beautiful, full page, color photo on a child model or realistic doll by Lindsay Kubica Photography, followed by a description, notes, and the pattern. Each design includes multiple pictures of the project (typically, at least one laid flat, and often pictures on different models). ● a pair of socks, a skirt, leg warmers, a toy, a head band, a bib, a pair of pants, a poncho, and a pair of slippers. Most patterns include multiple sizes (either newborn, 3-6 months, 6-9 months, 6-12 months, or 9-12 months) but some patterns are only available in one size. Kristi does include tips for upsizing many of the patterns, as well as the actual measurements for each project. My favorite designs are the Old-School Jacob Vest, Love Me Lots Toy, Moose Hat, Puppy Hat, Vivianne Slippers, and the Giraffe Hat and Button Diaper Cover. Kristi’s writing style is very conversational, and her designs are on trend. 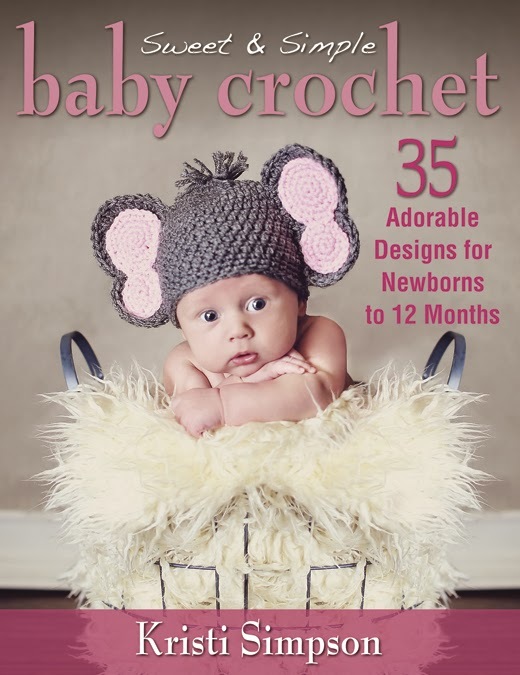 The photography is great, and the pictures of the cute projects on cute kids can only inspire you to get crocheting. And to keep the review balanced, I’d like to mention a few things that are missing from the book. In spite of the title, quite a few patterns are intermediate level and may challenge a beginning crocheter. (Most projects with unusual stitches or techniques include photo tutorials and/or extensive notes, so with a little patience and persistence, even a newbie should be able to create most of the patterns, though.) There aren’t any international stitch symbols, so this book is more suited towards crocheters who prefer reading patterns with U.S. pattern abbreviations. There are a few adorable projects for boys and some unisex projects, but there are more projects for girls in this book. If you are specifically crocheting for little boys, this may not be the book for you. As a softcover book, it doesn’t lay flat easily so it is difficult to crochet and read at the same time. Some of the patterns have already been published online through Kristi’s RAKJ Patterns company, so if you are a big fan of Kristi, you may have a few of the designs in your collection already. Finally, I personally find some of the realistic dolls used as photography props a little creepy. I fully understand that it is difficult (and probably not desirable) to take pictures with newborns, but it’s worth mentioning :). If you enjoy crocheting for babies and toddlers, this book would be a great addition to your collection. This would be a wonderful book for a new crocheter, and Kristi specifically recommends three of the patterns - Cream Puff Hat, Football Cocoon and Hat Set, and Cotton Candy Hat - for novice crocheters. Advanced beginners and experienced crocheters looking for quick and easy projects would enjoy this book also, particularly if they enjoy crocheting hats. And, of course, if you’re already a fan of RAKJ Patterns, you can get 46 of Kristi's patterns for a retail price of $19.95, far less than you would pay when buying individual patterns online. Full disclosure: A free review copy of Sweet & Simple Baby Crochet was provided by Stackpole Books. Although I accept free products for review, I do not accept additional compensation, nor do I guarantee a positive review. My reviews are based entirely on my honest opinions. 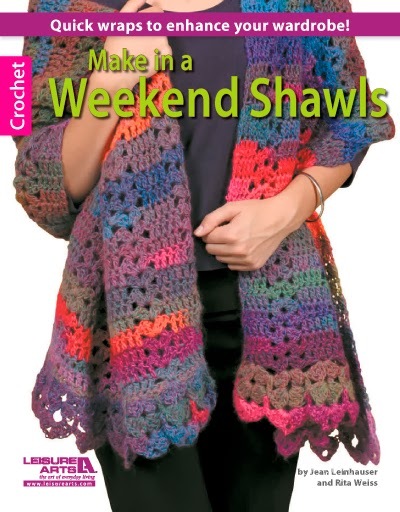 Make in a Weekend Shawls is a pattern booklet that collects 12 shawl designs made with medium or bulky yarns that can be crocheted within a short time frame. The booklet includes patterns by Cheri McEwen, Mary Ann Frits, Mary Jane Hall, Tammy Hildebrand, Margaret Hubert, Jean Leinhauser, Julee A. Reeves, and Shari White. The designs are split equally between easy and intermediate level patterns. Each pattern includes the difficulty level, size, a list of materials (written generically so substitution is easy, but also indicating which yarn was used in the sample), and special stitch patterns. The appendix provides tips for pattern reading and gauge, along with information on yarn weights and hooks. Most of the patterns are designed for women, but there are three patterns for girls. The designs include a variety of shapes. As you might expect from the book’s title, the shawls use a combination of basic stitches and thicker yarns to work up quickly. You won’t find intricate lace, or experimental contemporary designs in this booklet. As a result, the patterns are great for gift giving and charity use, since they are all practical and easy to wear. The booklet is thin enough to lay flat so you can crochet while reading. If you enjoy crocheting shawls or wraps for gifts and charity and/or quick projects in medium and bulky weight yarns, this booklet would be a good one to pick up before the weekend begins! Full disclosure: A free review copy of Make in a Weekend Shawls was provided by Leisure Arts. Although I accept free products for review, I do not accept additional compensation, nor do I guarantee a positive review. My reviews are based entirely on my honest opinions. Add-On Crochet Cables is an interesting new pattern booklet by Frances Burkes. Frances uses a method of braiding strips of simple crochet stitches to form intricate cable panels which are then sewn to the rest of the project. The booklet opens by introducing her method, with clear step-by-step instructions for forming the cables. There are 20 cable stitch patterns, each including the required number of chains for cable panels and base strips of various lengths. These patterns allow the reader to create their own designs or insert cable panels into existing projects. The booklet also includes 5 project patterns, for two bags, a sweater, a cowl, and an open cardigan, that incorporate the cable panels. Each stitch and project pattern includes assembly instructions. The booklet is written with US crochet abbreviations and while the instructions for Frances’s method are fairly clear, it would have helped to have some step-by-step photos of the process for braiding/twisting the cables and attaching them to the rest of the project. Some readers prefer international stitch symbols, which aren’t included. The booklet does lay flat, which makes it easy to read the details of the cable assembly process while crocheting. The Add-On Crochet Cables method is ideal for crocheters who like the look of cables but aren’t comfortable with post stitches or other techniques for crocheting cables directly into the fabric. Because each project requires a fair amount of assembly, this method is best suited for those of us who prefer to work in small pieces and then assemble later (e.g., those of us who crochet while commuting or traveling). Crocheters who are already proficient with other cable techniques, or those who dislike seaming/sewing parts together, may not find this book as helpful. This booklet would also be a fun introduction for crocheters who are looking to experiment with new techniques or methods. 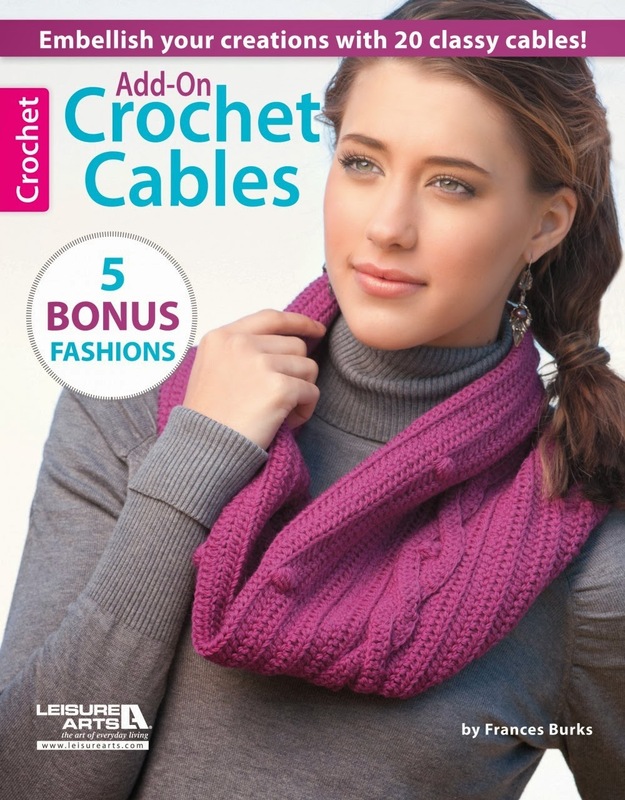 Full disclosure: A free review copy of Add On Crochet Cables was provided by Leisure Arts. Although I accept free products for review, I do not accept additional compensation, nor do I guarantee a positive review. My reviews are based entirely on my honest opinions. The CGOA 20th Anniversary Celebration Committee is pleased to make a blog and email button available for you to use to help promote our 20th Anniversary Celebration this year. Please download the image above to your computer. If you like, you can also include a link so people can find out more information about our Chain Link conference and the Knit and Crochet Show as it becomes available: http://knitandcrochetshow.com. Thank you for helping us spread the word about our celebration. Crochet Wraps Every Which Way by Tammy Hildebrand is a crochet pattern book featuring 18 designs for women’s wraps made with six different crochet techniques: traditional crochet, motifs, hairpin lace, broomstick lace, Tunisian crochet, and double-ended crochet. The book opens with a friendly introduction from Tammy, along with 10 crochet tips, most of which are to help your projects look more finished. This is followed by a glossary of U.S. crochet pattern abbreviations. The next six chapters are organized by crochet technique. Each chapter includes three patterns. Each pattern includes multiple, large photos of the wrap, shown from different angles. Several, including the Irish Jig (crocheted with hairpin lace) and the Ardeona Lace (crocheted with broomstick lace) are styled differently in each photo and can be worn around the waist as well. Each pattern also includes a skill rating and a glossary of special abbreviations. The Essential Crochet Techniques chapter provides written instructions along with process photos for all of the major stitches and techniques used in the book, including basic crochet stitches (single, half double, double, and treble), joining motifs as you go, hairpin lace (strips and in the round), broomstick lace (flat and in the round), and the basic forward and return pass for both Tunisian and double-ended crochet. My personal favorite patterns are the Purple Pineapples (in traditional crochet), Waiting for Willow (in motifs), Irish Jig and You are My Sunshine (in hairpin lace), Chica Mala (in broomstick lace), Cascading Rivers (in Tunisian crochet), and Zen Garden (in double-ended crochet). The book ends with a resources page, including information about the yarn and tools used for these projects, and a visual index with a thumbnail of each pattern for easy reference. There are no international stitch symbols used in the book. Like all paperbacks, it doesn’t lay flat, so it’s hard to crochet and read. While the process photos are great, some crocheters would prefer not to have to flip to the back of the book. Perhaps the photo tutorials could have been moved to the beginning of the relevant chapter. Although the different wraps are surprisingly diverse, there is really only one type of project in this book, so if you don’t love wearing (or gifting) wraps, it may not be a good book for you. Like all (mostly) pattern books, you may find that some patterns appeal to you more than others. 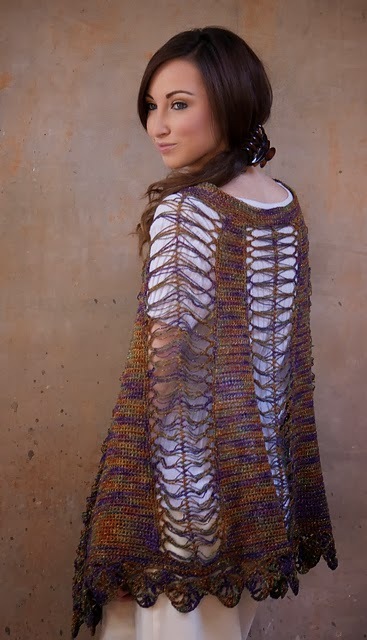 You can check out all the patterns online through Stackpole Books’ lookbook, here. 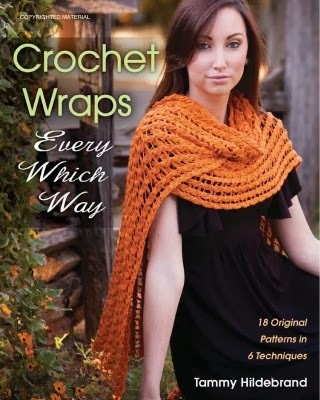 Full disclosure: A free review copy of Crochet Wraps Every Which Way was provided by Stackpole Books. Although I accept free products for review, I do not accept additional compensation, nor do I guarantee a positive review. My reviews are based entirely on my honest opinions. Teaching crochet seems like a natural fit for many as a way to share their love of crochet. Some even find a way to make it a career option. There are many different settings, styles, avenues and ways to teach crochet; one on one, informal, or structured; at some ones home, local guild, library, local yarn store, box stores, or trade show/conference; project based or technique based; and hybrids of each of these, as well as many more. So what does it take to teach? Basic understanding of the skill is a basic necessity, as well as being able to explain the same concept a couple of different ways. Having the ability to communicate well and interact with people can be a definite asset, as well as being flexible. Understanding how different people learn is an added plus. One of the traits that the most successful teachers share is excitement about what they are teaching. Teaching something that you enjoy is contagious and increases your students desire to learn. The more structured a teaching setting becomes the more a teacher has to prepare for a class. For one-on-one explanation it is more student driven and the teacher modifies the lessons to the desires and abilities of the student, the student usually shares what they want to learn next and what areas they wish to focus on. While teaching informal setting you may just be giving group instructions on one simple technique, you may not have a lot of props, examples, or any hand outs, but as it becomes more structured this changes. Many hours are spent before even entering the classroom, making up a lesson plan, having material available for students that may excel quickly in the class to keep them engaged, as well as ensuring that the material can be covered in the length of time given for instruction. Hand outs are created, questions are anticipated, samples are made, and rehearsals of the class presentation are done. The time spent actually teaching a student is only part of the job. Compensation as a teacher also varies greatly, by geographic area, by material, by subject, and by setting. Some are paid by the number of students, some by the hour, others a flat rate, and still some a combination of these. Check around to see what is reasonable in your area, if the compensation feels to low for you; you may not want to proceed. If you feel taken advantage of it will reflect in your teaching and thus may hurt future opportunities. If you are setting your own pricing, remember that you have value and what you are teaching has value. Offering a class for free, sometimes tells people it has no value, but charge a few dollars and they think it is a great deal. Do not forget to advertise yourself. Even if you are teaching at a venue, you will be expected to advertise the event and your class. There are many ways to accomplish this and it also varies by the location and venue. You might have to get a little creative, or use the standard tools in social media, but it is part of being a teacher; you need to engage with students even before they enter your classroom. There are varying degrees to which these teaching opportunities occur, and every teacher is different, as well as peoples teaching style. 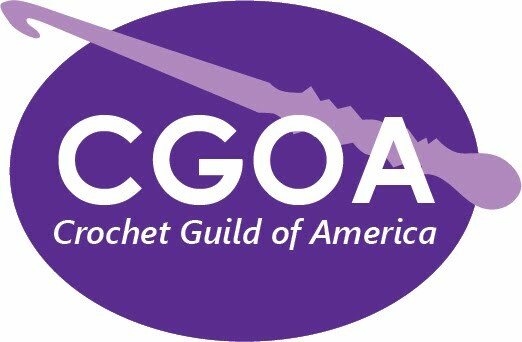 If you would like to investigate teaching crochet further, the Craft Yarn Council offers a teaching certification course, and the CrochetGuild of America offers mentoring for those that are Associate Professionals.